Noma, Copenhagen’s two Michelin star restaurant run by chef-owner Rene Redzepi, recently regained its title as the world’s best restaurant on The World’s 50 Best Restaurants list. Noma had previously been named world’s best restaurant three years in a row, but lost the title in 2013 when it was demoted to number two. With two Michelin stars and the title of the world’s best restaurant, obtaining a reservation at this 45-seat restaurant is extremely difficult. But if you’re lucky enough to get a lunch or dinner reservation at noma, you are in for quite a New Nordic Cuisine experience. Ready with empty stomachs for our lunch at noma. Co-owners Rene Redzepi and Claus Meyer birthed the Nordic Cuisine Movement in 2004 when they worked with some of the greatest chefs in the region to develop the New Nordic Kitchen Manifesto. The idea behind New Nordic Cuisine is a familiar one, using local produce and products for a farm-to-table type experience. The difference is the ingredients used in New Nordic Cuisine, served at noma and many other restaurants in Copenhagen, Denmark, and across Scandinavia, are completely unique to the region and different from what you find anywhere else in the world. Nowhere else will you find such a plethora of herbs, berries, and random plants foraged from the land and served on your plate. Reindeer moss anyone? Obtaining reservations at noma is quite an experience in itself. Noma’s website lists when reservations open for a specific window of time, and reservations open on the first Monday of the month. For instance, reservations for April opened on February 3, 2014, at 10:00 a.m. CET, which was 1:00 a.m. my time. 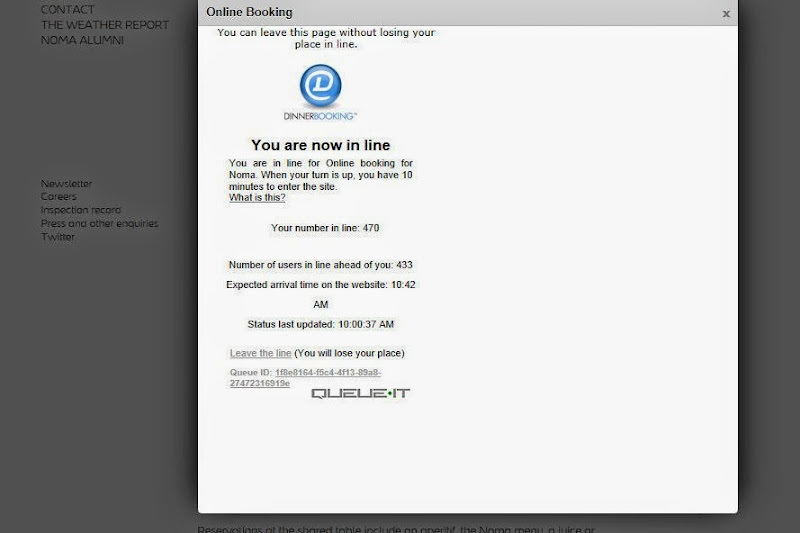 If you want a reservation at noma, enter the reservation system as soon as it opens. I entered noma’s reservation system at exactly 1:00 a.m. to find I was already number 470 in line. By the time it was my turn, at 1:35 a.m., there was only one available reservation during the five days we would be in Copenhagen, and that was for lunch. There are a limited number of two person tables, so it is actually easier to make reservations for a larger party. If you can’t get a reservation, you can sign up for the waiting list. There is also a shared table that opens closer to the dining date, but shared table diners are required to purchase a juice or wine pairing. Noma is located in an eighteenth-century warehouse on the Copenhagen waterfront in the neighborhood of Christianshavn. The décor is bright and modern with exposed bleached beams, functionally simple chairs and tables, and the very Nordic touch of animal skins hanging over the backs of half the chairs. From their seats diners can witness the final plating of each dish, which occurs in the constantly bustling ground level kitchen. Our meal at noma consisted of 20 small courses served one at a time. The first 10 courses served were small appetizers, followed by seven small main dishes, and finished with three desserts. The first 10 appetizers included red currants with lavender, Nordic coconuts, Reindeer moss and cep, cheese cookies with rocket, pickled and smoked quails eggs, caramelized milk and cod liver, white cabbage chips with samphire, æbleskiver with lovage and parsley, sea urchin toast, and burnt leeks with cod roe. The Nordic coconuts were actually hollowed out beetroots filled with warm soup sipped using a straw. The reindeer moss was crunchy, lightly seasoned, and to be dipped in the accompanying cream. The white cabbage chips were made from single leaves of cabbage cooked to be extremely thin and crunchy, with samphire, a crispy stalked green, sandwiched in between. My favorite of the appetizers, the æbleskiver, is traditionally an apple-filled sweet pancake ball popular at Christmastime. Noma’s æbleskiver was a savory version filled with lovage and parsley and brushed with a sauce of fermented grasshoppers. While most courses at a meal such as this are not necessarily something you would want to eat over and over again, the æbleskiver was an item I could enjoy multiple times, plus I now want to travel to Denmark for Christmas so I can try the traditional version. The seven main courses included a poached apple and kelp, shrimp and ramson with radish and yeast, milk curd and blueberries with lemon thyme and pine, beef tartar and ants, beetroot with sloe berries and aromatic herbs, egg and fresh greens, and turbot and nasturtium with cream and wood sorrel. The shrimp and ramson with radish and yeast was the most visually beautiful dish, with the shrimp sandwiched between two leaves like green ravioli, topped with herbs and colorful edible flowers, and floating on a light yellow sauce like lily pads. The most surprising dish was the beef tartar and ants. We didn’t hear the server say there were ants, so when I kept getting these pleasant bursts of sour citrus, I needed to identify the source of this surprisingly strong flavor. I narrowed it down to these small, dark berry-looking things. Upon closer inspection I discovered legs. Those ants really packed a flavor punch and I would eat them again in a heartbeat. A pond of shrimp ravioli and flowers. Already full we moved on to the final three dessert courses which included aronia berries and söl, potato and plum ice creams, and three treats consisting of yeast with salt and cream, a Danish pastry, and crispy pork skin with chocolate and berries. The aronia berries and söl was a frozen dish with söl, a curd cheese, enveloped in a frozen aronia berry puree. Any fan of crispy pork skin or chicharrones would love the puffy and crunchy pork skin completely covered with dark chocolate and dotted with freeze-dried berries. The plating area at noma. Reading ingredients like ants, fermented grasshoppers, and reindeer moss, you might be asking how such ingredients make noma the best restaurant in the world. We’ve been asked after dining at noma and El Bulli (the reigning champion for holding the title of the world’s best restaurant for the most years in a row) if they were the best meals we ever had. But restaurants like noma are not really about providing the most delicious meal you’ve ever eaten, with dishes you’ll crave for years to come. 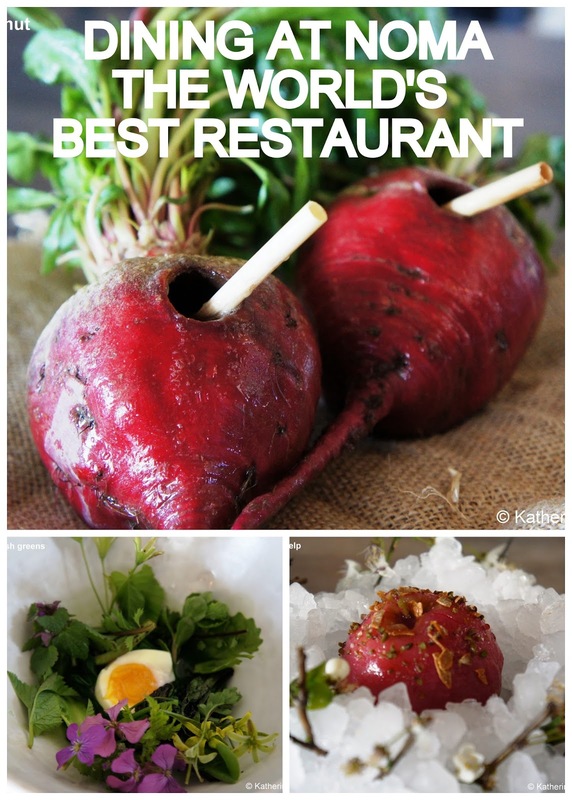 These meals are food experiments, the kitchens are test labs, and the diners are guinea pigs. The chefs working at noma, many of whom are unpaid interns from around the world, are getting the best food work experience of their lives and will move on to open restaurants of their own where they will take what they learned from making weird and wonderful courses and use those lessons to create new and inventive dishes which will later become standards in restaurants around the world. Dining at noma will not only provide you with the experience of eating at a Michelin starred restaurant holding the title of the world’s best restaurant; it will provide you with the opportunity to witness food history being made. The rest of our noma dishes. Click on the first to scroll through the full-size images.